Home » Binocular Vision Dysfunction Information » You Mean It’s My Eyes? The gift of sight is one of the body’s most remarkable and complex capabilities. The muscles that control the movement of the eyes are small but mighty, and are essential in the visual process. The extra-ocular muscles, which control eye movement (Figure 1), are what make it possible for you to move your eyes in all directions within the eye sockets. Two systems in the brain control these muscles: the inner ear (or vestibular) system and the visual (or oculomotor) system. The vestibular and oculomotor systems work together to aim the eyes in the same direction so both focus on the same point simultaneously. This results in the creation of a single, clear image. 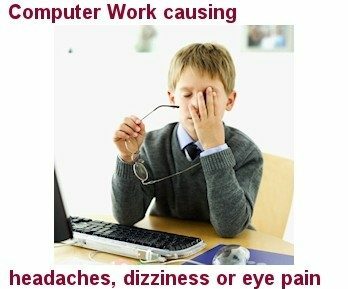 When the eyes cannot aim properly, the result can be unpleasant physical symptoms such as blurred vision, headaches and dizziness, and may even lead to reading difficulties. Patients with vision misalignment may experience only one symptom, or they could suffer the effects of multiple symptoms. Many of the symptoms of a visual misalignment are the same as those of other medical conditions, so it’s not uncommon for people experiencing these symptoms to seek answers from a variety of different doctors and specialists. Not surprisingly, they rarely receive adequate relief. And because most people are unaware that visual misalignment can cause these symptoms, they don’t realize that a visual specialist may be able to help. The ability of the eyes to coordinate is essential for the visual system to function correctly and for the eyes to align properly. When the coordination of the eyes is disrupted, vision misalignment occurs and the person is said to have Binocular Vision Dysfunction (BVD). Two common types of BVD are Superior Oblique Palsy (SOP) and Vertical Heterophoria (VH). A significant cause of SOP and VH may be a coordination problem between the two systems that aim the eyes: the visual (or oculomotor) system and the inner ear (or vestibular) system. In these cases, the vestibular system seems to be defective, which causes a small misalignment that, if left uncorrected, leads to the occurrence of double vision – something that the human brain cannot tolerate. As a result, the oculomotor system seeks to fix the misalignment and stop the double vision by forcing the eyes back into the correct position. The faulty vestibular system then acts up again, moving the eyes back out of alignment, and the whole process starts over again. These recurring cycles of misalignment and realignment cause a variety of symptoms, from eye pain and headaches (the result of fatigue and strained eye muscles) to anxiety, nausea, dizziness, lightheadedness and motion sickness (from the repeated back-and-forth movement of the eyes). Another method the body uses to correct visual misalignments is by tilting the head. When the head is tilted to the side toward the shoulder, images move down in one eye and up in the other. While tilting the head does help fix the misalignment, it can also lead to chronic neckache. Facial asymmetry, where one eye is physically higher than the other one (see Figure 2), can also be a factor in vision misalignment. Facial asymmetry or a nerve or eye muscle abnormality is something many people are born with. Over time, these individuals often start to develop BVD as the eye muscles are overworked. While the condition can manifest at any time, symptoms often develop around 40 years of age. BVD can also develop as a result of a stroke, brain injury or similar neurological disorder, which can happen at any time. BVD is a condition that often runs in families. While some patients exhibit few symptoms and aren’t greatly impacted by BVD, others have multiple symptoms that completely disrupt their lives and cause disability. Before treatment for Binocular Vision Dysfunction can begin, patients need to have a NeuroVisual Examination. This visual evaluation is much more thorough and detailed than a standard eye exam, which doesn’t often catch the signs of BVD. It checks for the slight visual misalignments that lead to BVD symptoms. Any problems with alignment, far vision or near vision will be treated and corrected using eyeglasses with aligning prismatic lenses. As a result of using these lenses, BVD symptoms are reduced and, in many cases, even eliminated. Do these symptoms sound familiar? To schedule a specialized exam with Vision Specialists of Michigan, give us a call today at (248) 504-2900 or complete our BVD screening questionnaire. Let us help you finally find relief.